So, I was trying to create an advertising intro for CB Motion Graphics – something simple but effective. I shot some footage of the cherry tree in my backyard (this was the first year that it had bloomed gloriously, and I couldn’t pass up the opportunity!) using my iPhone 4 on a Steadicam Smoothy that I then imported into After Effects. 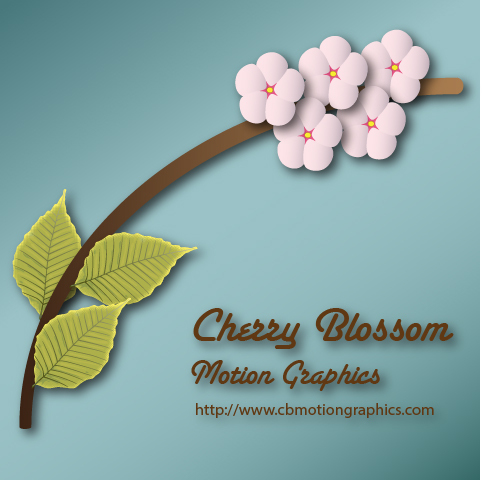 I wanted to have other blossoms grow out of the tree branch and bloom, but I didn’t want to draw them in Illustrator. Likewise, isolating a blossom in Photoshop wouldn’t give it the appearance of moving within the scene, so I decided to take a blossom out of the footage over time: rotoscoping. My first step was to track the motion of the branch that was moving in the breeze, and to get the rotation and scale values in case I wanted to add any elements later. Motion Tracking is itself an art, so I won’t try to explain my “methodology” here. Suffice it to say, there was a lot of trial and error! The next thing to do was to find and isolate the best cherry blossoms for the job. Thanks to the RotoBrush tool, taking elements out of footage has never been easier. I selected two blooms that looked like they would fit where I’d chosen for them to go and set the RotoBrush tool to work. After a little while, and a lot of tedium, I had my blossoms. 1) a layer’s anchor point is fixed and will not move relative to the layer unless instructed to do so by the user. 2) a layer’s position property is relative to the anchor point, not the layer itself. What I had to do was separate the tracking data from the layer, and then move the layer in response to the tracking data so that it would appear to stand still. I took the roto’d footage, pre-composed it, created a null object to contain the tracking data, tracked the motion of the roto’d layer for position only, and applied the data to the null object. After that, I set the anchor point of the roto’d layer to the point from which I would cause it to grow, and then expression pickwhipped the anchor point of the roto’d layer to the position of the tracker null. Back in the main comp, the new blossom appeared to stand still and was ready to parent as I saw fit. All that was left was to pre-render the blossoms and parent each to my original position/rotation/scale tracking. Adding a growing stem and “text in” to the video were the last (and easiest) steps in the process. Enjoy!